Holidays! What's new in your holiday music stash for 2018? Discussion in 'A Small Circle of Friends: The Music Forum' started by Rudy, Dec 4, 2018. So here we are, another December has landed, and some of us are gearing up for the season with some new holiday tunes. What have you picked up this year that is new to your collection? Is it a reissue you've had your eye on? A new release from a new or favorite artist? Share your discoveries with us! I have two in the ranks. One I picked up either late last year or early this year, but never played it. It's The Jack Jones Christmas Album, on Kapp Records. Fingers are crossed that this CD sounds acceptable--I picked up a different Jack Jones CD a year or two ago of the Wives and Lovers album and it had so much noise reduction applied that all of the life was sucked out of it. My big find this year is the JD McPherson record Socks. It's a decidedly retro music kick based on 50s R&B and early rock 'n' roll, with a touch of rockabilly here and there. McPherson is bringing the musical goods with a lot of fire and energy, and the album of original tunes here is a treat to listen to after all the tired renditions of slaughtered classics infesting the stores and radio this time of year. Refreshing and fun! The vinyl is a funky green pressing, and plays surprisingly well. The LP is the package to get, as it comes with a 12x12 book inside the jacket containing art by the same cartoonist who adorned the cover of this. A nice package to go with the record--it's a keeper! I'm streaming a few other off-the-radar releases to see what else I might like, and I'll give the notable finds here. I would shake packages and if they were "soft," or had a sliding smooshy sound inside, I would figure "Clothes!" and move on to something that was heavy or had a nice rattle to it. I just bought a blu-ray of the movie "Elf" and it came with a cool CD "soundtrack sampler" with five songs on it, including songs by Louis Prima and Les Brown & his Band of Renown. So I'll be spinning that. Nutcracker? If so, that's probably the most well known jazz arrangement of it. Setzer's band even plays that arrangement in concert. Yep, that's it....here is the full track list of what's on it. I hate "Santa Baby" but I don't think I've ever heard the Eartha Kitt version of it. Looking forward to the rest. Eartha's is the definitive version of it, if it's the 1953 version. I feel it's light on the double-entendre, but that was also 1953 when it was written. I like it, but I can see why it may not be a favorite. She could make songs sound suggestive without trying. How to catch the Christmas Bug, lesson one. Best new Xmas tune this year! We've played it a couple of times already today. 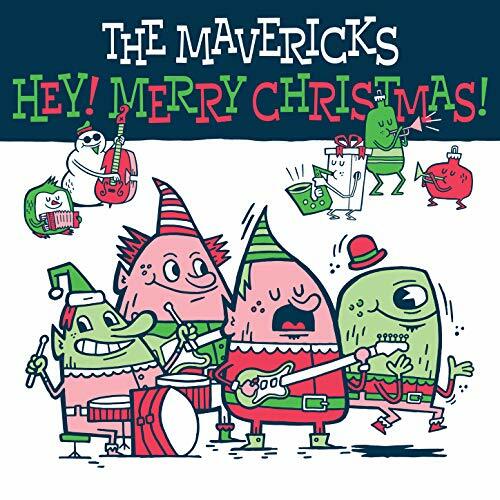 "Christmas Time is (Coming 'Round Again)" by The Mavericks. I wonder if I should get another copy since I might wear this record out. Two covers, the other eight are originals. Great stuff! And "Santa Wants to Take You for a Ride" is a great tune to chase away the "Baby, It's Cold Outside" haters.